If you’ve been reading my blog for a while now, you know that I am big on organization. And there are a few reasons for this. In addition to the straightforward (I like to know where things are, I and can’t stand clutter), I also value organization because its order and stability provide reassurance when I’m overwhelmed. As a type A person, I feel best when I can plan ahead, stay on top of my tasks, and have a general idea of what’s coming next. Obviously, this type of consistency day in and day out is not only unrealistic, but also a bit boring…even for me! Nevertheless, when the universe is particularly unpredictable, and everything feels completely up in the air, I often find myself seeking some semblance of stability. (Side note – that was a lot of alliteration!) And I do this by returning to a handful of different activities that provide that needed grounding. What is at the top of my list, you ask? Organization. Yep, I may not be able to plan everything that comes my way, but I can control the physical environment around me. Crazy as it sounds, it helps put my mind at ease. Can you relate to this bizarre thought process? Even a little? If so, read on. 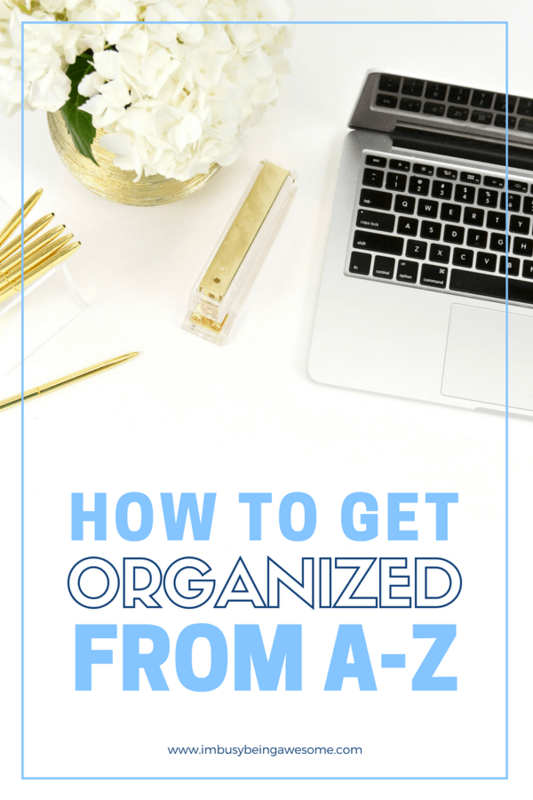 Because today I would like to share with you my A-Z list for organization. 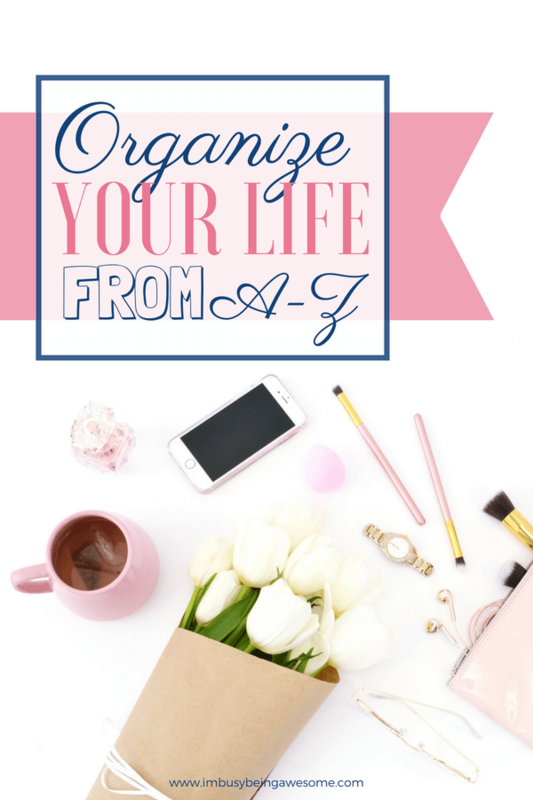 Begin at A, work your way through to Z, and organize your life today! Is your refrigerator a perfect representation of chaos with no rhyme or reason to its contents? What about your stove? Are the burners a bit… “loved?” Perhaps they could benefit from a good cleaning? Is the drawer underneath the oven packed with so many pots and pans that it hardly closes? Take a few minutes and organize! Empty out your fridge and start from scratch. Put all your dairy on one shelf, put your veggies and fruits in the crisper drawers. Get rid of unused/empty condiments bottles, and throw away old leftovers. Put a little elbow grease into that stovetop and rearrange your pots and pans so they fit easily into the drawer (donate the ones that don’t!). You will love how easy it is to grab the pan you need without rearranging 8 others on top of it. Looking for more kitchen organization tips? Check out this post! Luckily, there are so many FREE resources out there. If you’re looking for a great place to start, Penny Pinchin’ Mom has some helpful strategies. I’m especially fond of her post, How to Create a Budget That Actually Works (Even if You Such at Budgeting). Have you ever heard of having a command center in your house? Basically, you choose an area in your home that everyone passes on a regular basis. Perhaps there is a space in the corner of your kitchen, maybe it’s a spot in the hallway leading upstairs or a nook in the central gathering area that’s visible, but tucked away. Designate this place as your family “command center,” and use it as a place to organize the ins and outs of your family’s life. Best of all, this idea is incredibly flexible; you can easily adapt it to fit your family’s needs. Generally, the command center includes an updated calendar of coming events, a whiteboard or chalkboard for reminders/messages, hooks for car keys, a charging station for electronics, slots for important papers: ingoing/outgoing mail, receipts, permission slips, bills, etc. It’s a great way to keep everyone organized and on the same page. My husband collected DVDs for years, which means that we have a TON of them. Our collection grows increasingly disorganized over the weeks and months. Eventually, it’s utter chaos and the need for organization is unavoidable. Computers, iPods, iPads, phones, cameras, wireless headphones…and all of their chargers. As you know, most of us are surrounded by electronics all day long. Add a bit of structure to your world of electronics by having a designated charging station for all of your devices. This keeps everything in one place and reduces the chances of losing all of those extra charging cords, plugs, adapters, etc. You know those papers piling up in your office desk drawer? The ones you were going to sort through last December before the New Year? They’re still there. And by waiting on your “I’ll get to that eventually” list, they’re causing unnecessary stress. Move these papers to the “get it done now” list. I’m willing to bet that it will take much less time than you think to sort through them all. Then, establish an efficient way to file those papers away (either by scanning and shredding, or maintaining paper copies), and keep up with it! It’s much easier to file one or two papers as they come your way than letting a year’s worth pile up in that pesky desk drawer. Yep – the garage. Really. Take a deep breath and do it. This may be a multi-day project that requires a major plan of attack. That’s okay. But do it. Think how fantastic you will feel once you’ve weeded out the extra shoes your kids have outgrown and donated the sporting equipment you never use. Imagine how refreshing it will be to throw away all that extra stuff that you put in the garage to “deal with later.” Guess what – it’s later. Deal with it. You’ll be SO glad that you did. Is your handbag/purse a catchall for everything? Do you carry around way too much stuff (i.e. your shoulder is tired from holding it after a day of shopping)? Does it take you entirely too long to find your keys/wallet/phone when you need them? Can your masseuse tell the shoulder on which you carry your bag? If so, it’s time to empty out the excess and carry only what you need. Whether you have boxes of old family photos or a messy collection of digital pictures, take some time and organization the chaos. Create categories for the different images, and file them in each category by date. It will make finding the pictures from last year’s vacation SO much easier. Uggggh, the dreaded junk drawer. Seriously, why do we even have this drawer?! Take 10 minutes, empty it out, decide what you need, and toss what truly is junk. Easy. In our house, the kitchen is always the first place to look like a bomb went off. Set aside some time to wash any extra dishes left in the sink, clean off and wipe down the countertops, recycle your old mail, etc. If you’re really ready to dive into decluttering your kitchen, check out my 10 steps here! Is your laundry piling up? Are you down to your last pair of socks? It might be time to throw a few loads in the washing machine. On the flip side (and this is my problem), do you have two weeks of clean laundry sitting in your laundry basket waiting to get put away? Take control – put a few loads of laundry in the machine, hang up your clean clothes, reduce the visual clutter, and feel awesome when it’s done. Do you have a mudroom that acts as your “catch all?” Recruit the help of your family on this one (you shouldn’t have to sort through everyone’s “stuff.”) Give each person a box/bag/laundry basket etc. and have them fill it up with everything that is theirs. If each person takes 10 minutes to put away their own belongings, you’ll have a clutter-free, organized mudroom in no time flat. Maybe it’s just me, but my nightstand manages to accumulate a ridiculous amount of stuff…and it’s such a tiny space! Extra chapsticks, notepads, water glasses, finished books, pens, you name it. If you’re anything like me, you have a few too many things on your nightstand. Clean it up! Whether your office is at home or at work, you likely spend quite a bit of time in this space. If you have piles of unorganized papers everywhere, stacks of books covering your floor, and you cannot see your desk buried under who knows what…it might be time for a quick clean. File away your papers, store the books on your bookshelf, put your extra pens and pencils in a holder, and throw your spare paperclips in a container. In other words, put things back where they belong. I’m willing to bet that once your space is organized, you’ll have an easier time getting your work done. If you’re feeling extra gung-ho, get some labels made; I love having them for all of my different containers. 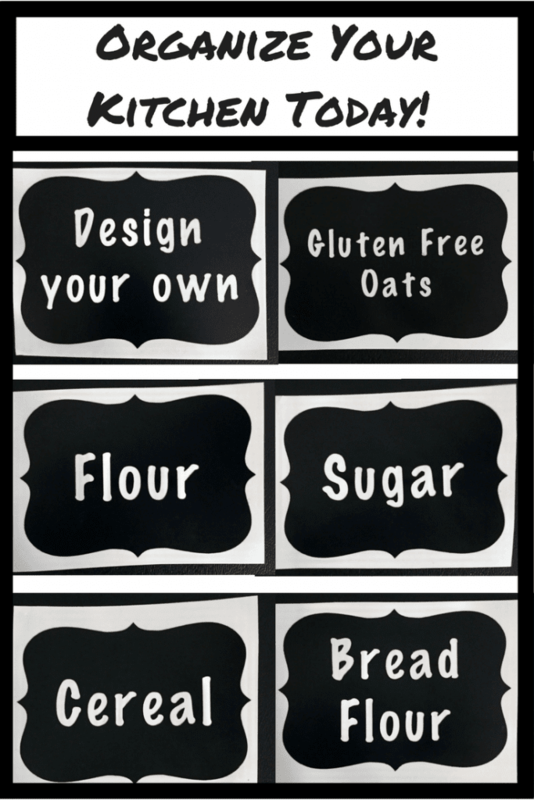 Hop over to my Etsy page and special order whichever labels you need for your home. I’ll mail them right to your house! The funny thing is, it only takes a few minutes to fold everything up and put it neatly on the shelves. So do it! And just like that, no more unnecessary blanket avalanches. Do you have several bottles of half-used shampoo, body wash, conditioner, lotions, face wash, scrubs, and soaps in your shower? What about the countless bottles of hair sprays, gels, and mousses, or the numerous makeup samples you received with your last purchase from Clinique? It’s time to go through them all, keep what you actually use, and get rid of the rest. Looking for the quickest bathroom organization hack around? Check out this post here! Do you store stuff under the bed? When Ryan and I lived in our last place, we kept all of our extra stuff under the bed in both the guest room and our room. Sure it looks fine from the outside, but lift that bedskirt and it’s sheer chaos underneath. Take some time to organize your stuff in those large under-the-bed totes and label each one. It will make things so much easier for you next time you want to find your family photo albums or winter sweaters. It is so easy to leave things in your car to grab “later.” That extra coffee mug, the few books on the passenger side floor, the coat in the back seat, the pair of sneakers in the trunk, the receipts from the Starbucks drive-through piling up in your cup holder. This slow accumulation of stuff can create a similarly slow building of stress. So grab a box, fill it with everything that doesn’t belong in your car, and then go through the house putting all of these re-discovered items back in their original place. Okay…this tip goes for any closet – I just already used C for the command center ;-). Closets are some of the biggest culprits of disorganization. Why? Because you can hide the mess behind closed doors. Take it slow if necessary, and tackle one closet at a time. Get rid of the extra stuff, hang up the clothes that have fallen off their hangers, actually put the shoes on the shoe racks etc. I know, I know. Total cop-out. But honestly, I couldn’t in good faith tell you to organize your x-rays or your xylophone mallets. So we’re going with x-tra stuff. Grab a laundry basket and do a walkthrough of the house. Do you see something out of place? Put it in the basket. Once you’ve finished your walkthrough, go through one more time putting everything back where it belongs. Easy! Have you been putting off your fall or spring clean up? Is it time to mow and water the lawn? Are your hedges WAY overgrown? Spend an hour or two tending to your lawn. Not only are you getting your work done, but you’re getting fresh air and exercise. It’s a triple win. Yeah… I admit it. This is an even bigger stretch than x-tra stuff. BUT, Zooloretto IS a real game, and I wasn’t going to tell you to organize your zipper collection. What’s more, my board game shelf does get ridiculously messy, especially after a few game nights. So enlist your kids to help organize your game shelf. That way, you can immediately find Zooloretto next time you need it. And there you have it! 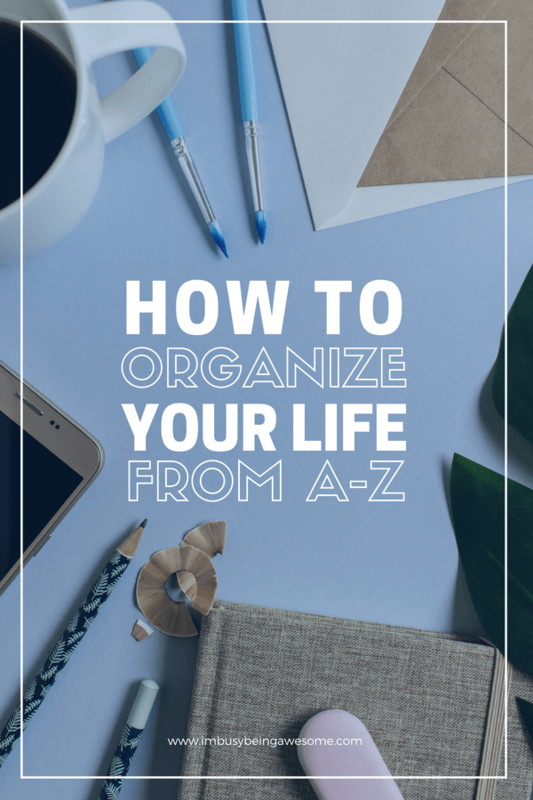 Next time you get the hankering to organize your surroundings, pick a letter and get to work. Need an easy reminder? Download this FREE checklist. Print it out and keep it in your command center for easy access! So tell me, what are your tips for organization? How do you create a feeling of stability when chaos strikes? Let me know below! Sometimes we get mixed with many things and just let life move, but organization is one of the best ways to avoid this. Thanks for sharing the tips. My bedroom and closet seem to be the first to get neglected!!!! Great tips here!! I just love this. I need to take a weekend and knock all of that out. Thanks for the great tips. Organization has never been a strong suit of mine. Organized chaos is more like it. It may look a hot mess, but I can tell you to the inch where everything is. This list is fantastic, I’m working towards having a pleasant appearing, organized home. Ha! At least you know where everything is 🙂 That’s the most important thing. OH MY GOSH!! This list is incredible!! 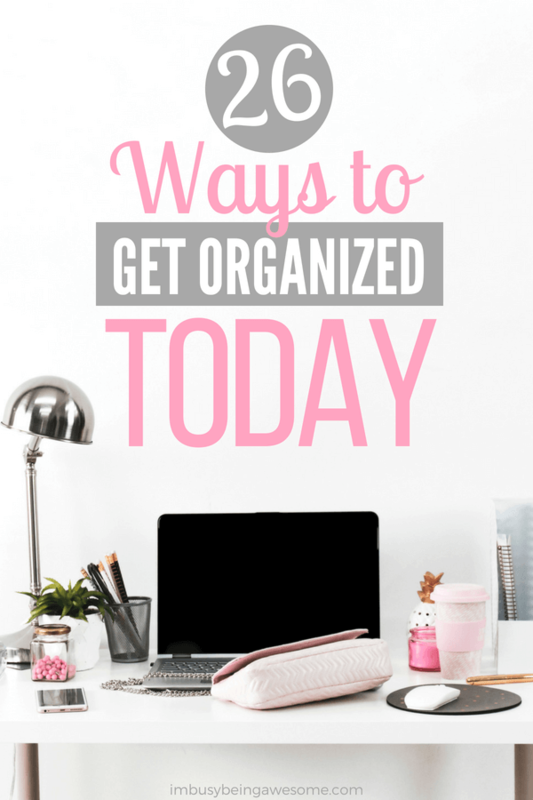 Great organizing tips and what a fantastic list, now to get just get on that list and start organizing! Thank you for sharing! Love this! This is quite the exhaustive list. Seeing it written in black and white makes it easier to focus on one task at a time. Thanks, Leslie. I agree. When I can work letter by letter, it feels less chaotic and overwhelming. Great list! I’m 33 weeks pregnant and am starting to feel the urge to nest and seriously reorganize the house before the baby gets here. I’m keeping these in mind! this is a perfect list!! thank you so much for this!!! bookmarking! What a helpful post. I am just like you and need the stability that being organised brings. My husband however is rather more cluttered. I am going to show your website to him (hint hint)! Thanks so much. You always have great posts! For me and dvds, I got got rid of them lol. I mean, who really watches dvds anymore?! What a fantastic and cohesive list. I feel like I need to print this and put it on my fridge to tick off each section. I need to do all these things!! Scary. Do it! That’s what I do 🙂 It’s forever a work in progress, isn’t it? Thanks for sharing, love the A-Z list! I like being organized but sometimes its hard to find the time. If you just smart small and do a bit at a time it’s totally doable and you feel way better! Yes, exactly! If you try and organize everything at once it’s just too overwhelming. Baby steps are key.